Modernist landmark will be revised and preserved with progressive office solutions for 400 employees. 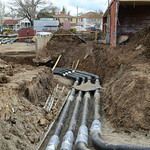 (SACRAMENTO, CA) – The Sacramento Municipal Utility District (SMUD) is rehabilitating their historic headquarters building, which has been in continuous original use since 1960. 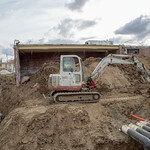 Construction started in January 2018 and is scheduled to be completed in the first quarter of 2019. Dreyfuss + Blackford Architecture (D+B) designed the headquarters in 1958 and has been commissioned to renovate the 131,495-square-foot facility and revamp the interiors. 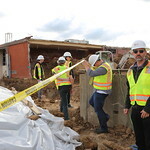 The project includes restoration of the historic fabric of the building and tile mural, new glazing, installation of sustainable mechanical and electrical systems, and redevelopment of the open office area, and hazardous materials abatement. 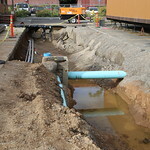 The updates accommodate changes in the workplace as well as the changing culture of SMUD. “Our legacy approach serves to preserve the fundamental characteristics inherent in the original design of this important Mid-Century Modern structure,” said Kris Barkley, AIA, design director of D+B. “By building upon and restoring character we are adapting the building for up-to-date technological and design standards. Each character defining element respectfully balances the needs for preservation and expansion,” he added. Water City, the exterior Italian tile mural wrapping three sides of the building, by world-renowned artist Wayne Thiebaud, will be cleaned, restored, and preserved. The mural has been covered to protect it during demolition and removal of hazardous materials inside the building. 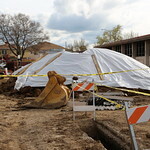 “We want to attract and retain the best employees and these much-needed updates help us do that while still maintaining the historic character of the original building,” said Arlen Orchard, SMUD CEO and General Manager. By replacing outdated mechanical shafts and enclosed spaces, the re-imagined building core houses conference rooms and a large open stair for improved floor-to-floor circulation that encourages walkability and visual connections between wings. Clad in distinct but compatible materials, the new core was designed to provide transparency by replacing precast concrete panels with glass and aluminum framing. D+B is designing the new offices to address today and future office technology environments to retain and attract top talent. These environments have an increased focus on employee health and wellbeing, as well as more options for collaboration and mobility like informal collaboration areas, teamwork spaces, unscheduled meeting spaces, quiet rooms, and additional and various sized meeting and conference rooms. Additionally, the architects are planning new amenity spaces including a coffeehouse at the top of the new core, dining enhancements and expanded event spaces. Other innovations include: a new sun tracking roller shade system and thermochromic self-tinting glazing in the circulation core; flexible office systems incorporating ergonomic advances; and new landscaping and accessible paths preserving most of the existing outdoor spaces. Callander Associates Landscape Architecture, Inc., is updating while recreating the historic Mid-Century Modern character of the existing 13-acre site. 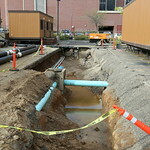 Improvements include alterations to campus pedestrian connectivity and meeting current accessibility and life safety code requirements. Employee safety and security is also at the forefront of the upgrades, with lighting and landscape elements designed to incorporate the latest Crime Prevention Through Environmental Design (CPTED) practices. 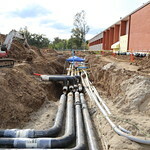 Site improvements will contribute toward several U.S. Green Building Council (USGBC) LEED credits including rainwater management and landscape water-use reduction through selective replacement of areas with lower water-use plants and updating outdated site irrigation. New sustainable elements include: state-of-the-art, high-efficiency, low-volume mechanical systems; new insulated glazing; LED lighting; low water use fixtures, and incorporation of biophilic features throughout. SMUD Headquarters renovation is designed to achieve USGBC LEED Gold certification. The Sacramento Municipal Utility District Headquarters is listed on the National Register of Historic Places. When completed in 1960, the project appeared on the cover of the Real Estate section of the New York Times, and has since been featured in multiple international and national publications. Wiss, Janney, Elstner Associates (WJE) is working with Dreyfuss + Blackford Architecture as the historic preservation consultant on the project. 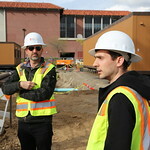 Alan R. Dreyfuss, AIA, associate principal and SMUD Headquarters Renovation project manager at WJE, is the son of late architect Albert M. Dreyfuss, founder of Dreyfuss + Blackford. Dreyfuss + Blackford Architecture, founded in ­1950 in Sacramento, CA with an office in San Francisco, is a 38-person firm headquartered in the California capital. The firm serves corporate, public and institutional markets with solutions achieved through collaboration and innovation. Committed to a sustainable future, D+B brings expertise in architecture, master planning, interiors, graphic design, and construction services. Recently completed projects include The Shop at VSP Global, E. Claire Raley Studios for the Performing Arts, and Yolo County Woodland Superior Courthouse. As the nation’s sixth-largest community-owned electric service provider, SMUD has been providing low-cost, reliable electricity for more than 70 years to Sacramento County (and small adjoining portions of Placer and Yolo Counties). SMUD is a recognized industry leader and award winner for its innovative energy efficiency programs, renewable power technologies, and for its sustainable solutions for a healthier environment. SMUD’s power mix is about 50 percent non-carbon emitting. For more information, visit smud.org.